“One of the South Coast’s finest properties…. “Nestled deep in the lush foothills of Woodhill Mountain and perfectly positioned to provide sweeping rural and escarpment views, this private and prestigious property is the ideal retreat for those looking to establish either a fruitful equine or livestock property whilst still enjoying a peaceful and luxurious lifestyle. “The home is the epitome of grand featuring 16 feet ceilings, exquisite finishes and that traditional country feel, all whilst being perched in a commanding location from which to survey the enchanting landscape that surrounds. Woodbyne, a country garden estate at Berry, has sold for $5 million. Woodbyne, Jeff and Annette Moore’s country garden estate and private boutique hotel at Berry on the south coast, has sold for $5 million through Bill Bridges of Ballard Property. Located in the hamlet of Jaspers Brush, 3½ kilometres from historic Berry village, the property was purchased by Rosie Jennings, who operates Terrara House Estate, a highly successful wedding venue on a historic estate about 20 minutes’ drive south of Berry. Jennings bought Woodbyne to expand her wedding business. Set in magnificent gardens with avenues, garden rooms and a swimming pool, Woodbyne has several buildings including a weatherboard main building, which originally was a school house. The property was developed by entrepreneur and designer John Pegrum, who sold it to the Moores for $942,000 in March 1997. When Pegrum bought the property 20 years ago, Woodbyne’s weatherboard former schoolhouse building was in a dilapidated state and stood in a bare paddock. The formal reflection pool is framed with clipped Manchurian pears. A bronze statue stands at the end of the pool, against a curtain of Bhutan cypress. 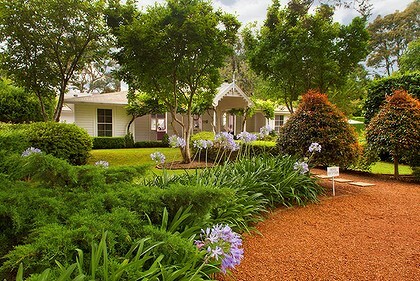 Guests of the hotel can stroll around the gardens at their leisure.